Dev Patel is a fascinating actor if only for his relatively small sample size over the last eight years. He stunned us all in Slumdog Millionaire, would probably like to forget The Last Airbender, made all our moms smile in Marigold Hotel, and starred in Chappie, which I might be the only critic in America who gave a good rating. But that’s nearly it, Patel has not inundated the screen with his roles over that span, taking the exact opposite approach of someone like Alicia Vikander. Is he being more selective, is he just not the most sought after talent, or are his best days still to come? 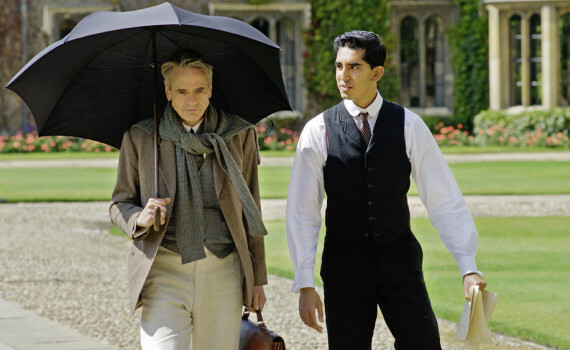 The Man Who Knew Infinity won’t be the film that you watch thinking that Patel is holding back amazing stuff, waiting to unleash it on the world. On the contrary, it’s a movie you probably won’t be thinking on much during or thinking of at all after. This is the true story of Ramanujan, the Indian mathematics genius who, though he had no formal training, changed the intellectual world with his unique brand of thinking. Living the life of the poor in Madras, Ramanujan fought every day to have his theories heard, even writing these complicated equations on the floors of his temple. Where did this understanding of mathematical formulas come from, if not learned in textbooks? Why, from God, or so he claims, and the inability to share them with mankind begins eating him up inside. But he finally gets his chance after word of his work reaches England, piquing the interest of G.H. Hardy, a fellow of esteemed & seemingly unreachable Cambridge. Ramanujan travels there, to an unknown place, far from his family, to become published in & accepted as part of the intellectual circle, a dream becoming more & more a reality. ‘Boring’ is probably the best way to describe The Man Who Knew Infinity, and perhaps we should have seen that coming. Actually, I did, as you can see from reading my prediction after watching the trailer. The film just looked so dull, so unexciting, and didn’t seem to have an original bone in its cinematic body. That’s exactly how it turned out, unmentionably commonplace, and not impressive in the least. All involved tried very hard to impress upon us how great these discoveries Ramanujan was making really were, how much they affected the established theories of the time, all set against a backdrop of war, racism, & death. But I can’t be the only one who was bored by this story line, as well as by the acting. Patel was the definition of one note, and although Irons was solid, he couldn’t do much to make his speeches interesting, especially when they were full of jargon that, even if we understood it, didn’t compel us in the least. A movie worth passing over, it seems the few who saw it liked it fairly well, but I won’t be adding my name to that list or recommending this film any time soon.